Touch typing usually involves placing the eight fingers in a horizontal line along the center of the keyboard (home row) and having them to reach for different keys. A person who spends most of his daily touch typing is usually an audio typist or a copy typist. It is widely beleived, Frank Edward McGurrin, a court stenographer from Salt Lake City apparently invented touch typing in 1888. On a standard keyboard for English speaking country the home row keys are: "ASDF" for the left hand. Similarly, "JKL;" for the right hand. As the first six letters on the keyboard are QWERTY, these keyboards are named as QWEARTY keyboard. Most modern computer keyboards have a raised dot or bar on the home keys for the index fingers to help touch typists maintain and rediscover the correct position on the keyboard quickly with no need to look at the keys. A method taught since the 1960s (and perhaps earlier): The left little finger is used for the keys 1 2, the ring finger for 3, the middle — 4, the left index finger is responsible for 5 and 6. On the right side of the keyboard: index — 7 and 8, middle — 9, ring — 0 and the little — all other keys on the right side of the upper row. Probably these two methods reflect the layout of the typewriters from early days when some of them have no 0 and/or 1 keys. Obviously this method was used when computer keyboards was not commonly existing. Some specialized high-end computer keyboards are designed for touch typists. For example, many manufacturers provide blank mechanical keyboards. A trained touch typist should not mind using a blank keyboard. This kind of keyboard may force hunt and peck users to type without looking. The old method used for keyboarding which is used widely is the “hunt and peck” method of keyboarding. It is a very tedious and ineffective typing method. 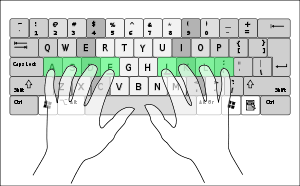 People using this typing style are either not capable or not willing to spend time for memorizing the keys position on keyboarding for adopting the standard the finger position techniques. Unless we are a person who interacts with the keyboard rarely, we will definitely benefit from efficiency which is generated through memorization of keyboard and touch typing methods.